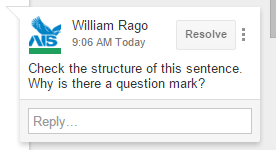 Google Drive and its integration with Google Classroom has made a huge difference in my classroom. One of the biggest advantages I have seen so far is the opportunity to provide differentiated corrective feedback on student writing synchronously. This means I can give students (a whole class of students) comments and suggestions, and highlight errors as they write. The comments below show the range of support a teacher can provide based on the level of each student. Each comment asks the student to self-correct or clarify, though the effort required to make the correction varies in each comment, matching the ability of the student. 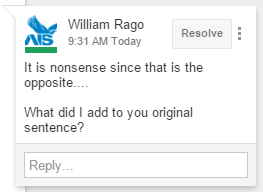 As you look through comments, ask yourself what each comment requires the student to do to make the correction. In the past, differentiating writing feedback was a time consuming, ink-draining process that seemed to have little or no effect. Now, I feel like I can support the students appropriately while they are in the process of creating writing. Going through these processes with the teacher will help students retain what they learn. In my most recent post, I outlined the steps necessary to set up online literature circles using Edublogs. Since then, the literature circles have begun, and we’ve just finished the fourth week. In this post, I’ll share some samples to show what is actually happening in the circles, and discuss the challenges and issues that have come since they started. As you read, keep in mind that the students are already maintaining their own personal Edublog and are familiar with all of the procedures and tools necessary to post on the class blog. As a precaution, I made a short tutorial (click here for video) and gave a short reading assignment (chapter one of The Giver) to practice posting and commenting. I didn’t spend the entire weekend reorganizing student posts, so I have to say they were successful. Each student receives a schedule, like the one here, which tells them what they are responsible for each week. It includes their role and a checklist that describes the three things that need to happen every week. Throughout the week, students read the text and develop the post for their specific role. Posts are due at the end of the week, and the summarizer in each group has up until the day of class to complete their assignment. This gives them a few days to read through all of their group’s post and summarize. 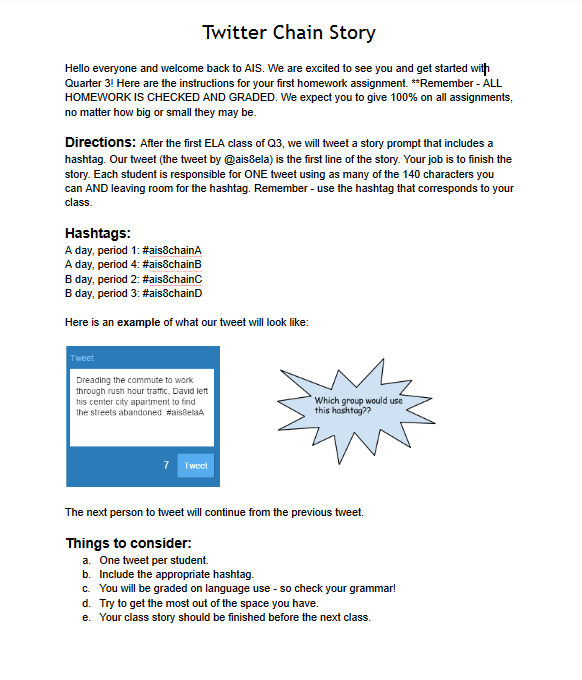 The links here are to the documents that are embedded in the class blog. These documents describe the overall assignment and the specifics of each role. This example shows the five questions that a discussion director asked their group. It also highlights one of the mistakes many discussion directors made in the first few weeks. While it looks like there are five questions here that cover the main points of the reading, the student failed to follow the specific instructions that come with being discussion director. Each question is supposed to serve a different purpose. 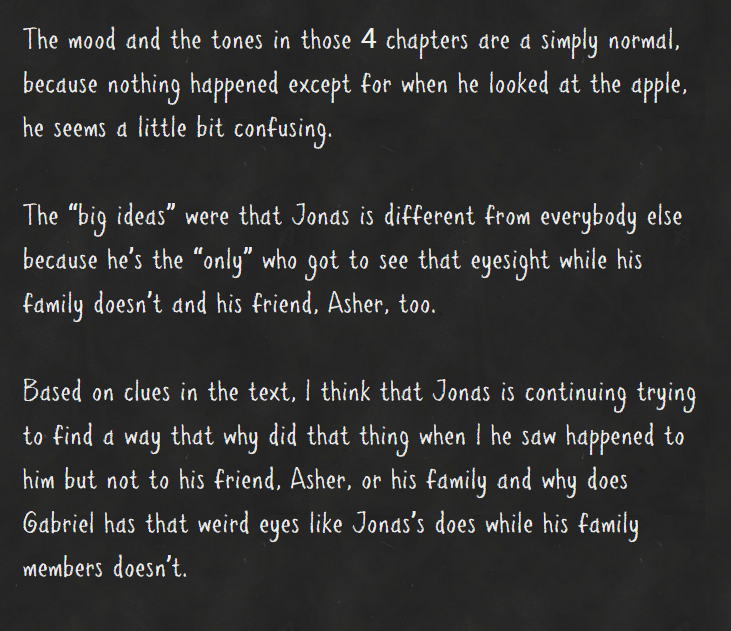 For example, question one should be a closed question that makes sure everyone noticed an important plot detail. Question three should be a a question to the author, Lois Lowry. This question is supposed to spark discussion about something that would help readers better understand the text. In this example, the student is on the right track, but the way the question is formed is incorrect as the author would know who the old are. In the future, I know I have to spend more time going through each type of question and provide more examples. Now that we’re in week five, most discussion directors are getting it right, but the confusion could have been prevented with clearer instructions. The response below shows that the questions did get the student to pull things together and draw some conclusions, but the product will be much better when the right questions are asked. This is a good word wizard example. Each word comes with a sentence to contextualize it, a page number, the student’s own definition, and the dictionary definition. Many students comment on Word Wizard posts and say that they also didn’t know the selected words. Visualizer posts with Fotobabble are going really well. Students are using the sentence frames provided in the instructions and are getting creative with their drawings. Students that don’t feel comfortable drawing can use another image or group of objects to depict a piece of the text. Last week, a student used his younger brother’s Lego figures to set up a scene from the reading instead of drawing a picture; it was well done and the class enjoyed it. So far, the connector seems to be the most popular role as it receives the most comments. Students are doing a good job of making real world connections; however, in the future, text-to-text connections need to be a requirement. They are by far the least common connection that I’ve seen so far. Here are some comments to the above post. This example shows the reflector commenting on big ideas as they work their way though the text. Page numbers need to be included so that the group members can follow the reflector’s thoughts as they read specific parts of the text. The last student from each group to post each week is the summarizer. The summarizer’s job is not to summarize the reading, but to summarize the discussion that happened online. In this example, the students discusses the group’s response to the discussion director’s questions and the vocabulary selections. I would like to see more substance in the post and less listing. Students will often list all of the director’s questions and the vocab in a effort to lengthen the post, which is unnecessary. There is enough material in the posts and comments to write a good summary that highlights the most interesting material. Though there are many small things that need tweaking before the next time this happens, the literature circles are making the reading that happens at home active and promoting a deeper understanding of the material through discussions and peer feedback. In our school, where many of the students need language support and lack the confidence to speak during classroom activities, the online literature circles are providing opportunities to request clarification, check comprehension, and to demonstrate understanding prior to class. This results in more participation and interaction and ultimately, more language development. Last year in our 8th grade Language Arts class, we used literature circles to read The Giver by Lois Lowry. We are using the book again this year, and to increase the amount of student talk that happens in the classroom, I am moving a lot of the discussion online. Since I have a large number of non-native speakers in the class, the online discussion serves as a primer for the discussion that will happen in class. 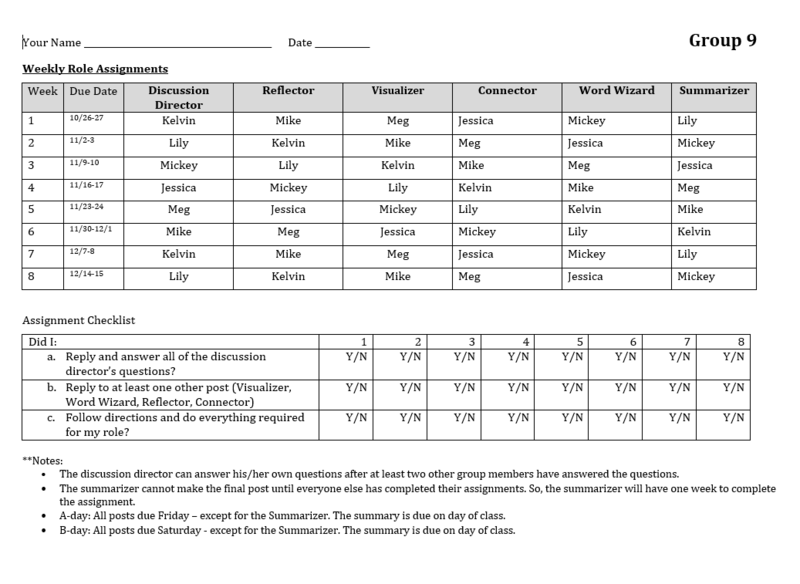 If each student does their homework, they will be able to contribute to the group discussions in class. If you are unfamiliar with literature circles, here is a crash course. To set this all up, I am using Edublogs (Pro). I put a lot of thought into finding the easiest way to get everything organized online in a way that is easy for students to navigate. This is what I’ve come up with. If you know a better way, please share ASAP! First, I thought about what I needed to make available online. I started by creating a page named ‘Literature Circle’. This is the main page for all of the work we’ll do in the unit. I used a page and not a post so the content is always there, in the same place. Here, I will put up the general literature circle instructions. 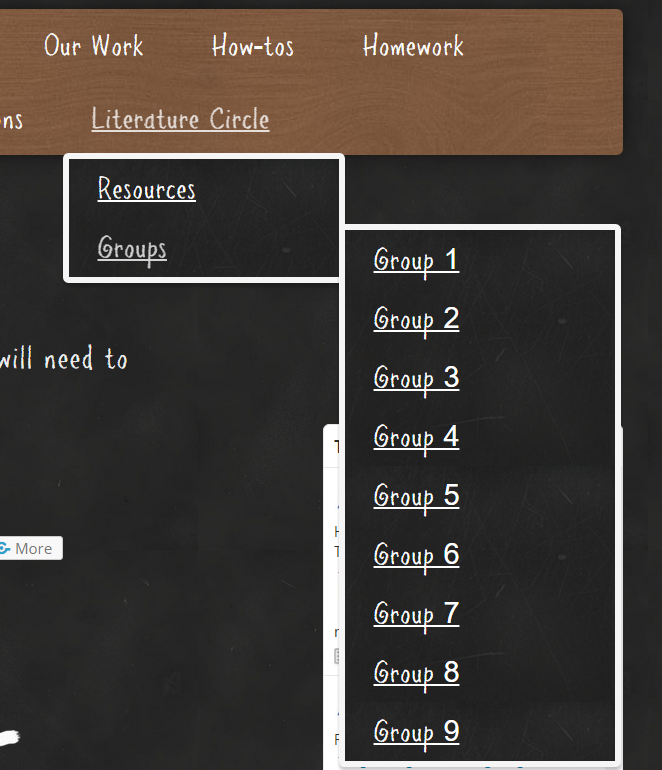 Next, I created two more pages called resources and groups. These pages have the parent page Literature Circle. On the resources page, I will put up the role instructions; the groups page will have group lists and reading/posting schedules. Now for the part that took the most thought. I’ve decided on categories as the way student posts will be organized. I chose this because selecting a category when you post is simple. Also, I can create the categories myself. First, I created nine categories (Groups 1-9). Then, I added those categories to the menu below the groups page. Now, here’s what I imagine happening when the assignments begin. Each group has one member that will start the discussion (summarizer). When the summarizer posts, they’ll have to click the category for their particular group. Once they do this, their group members will be able to find the post easily by clicking on their group from the drop-down menu. From there, the rest of the group can comment and add their own posts the same way. Here you can find copies of our presentation and all assignments/handouts that were shared during the presentation. “In the depths of New York City, on top of the Empire State Building, a creature rested.” This is the first line of @ manyvoices, a Twitter story written collaboratively by 140 elementary and middle school students across 6 countries. The story began with Mr. George Mayo, a teacher in Washington D.C., and was eventually edited and published. You can find a free pdf here. We are using a similar model in our 8th grade language arts class to begin our unit on creative writing. the major difference between @manyvoices and our assignment is that Mayo created one twitter account for all contributors to share while we are using hashtags to collect and present the story using Storify. The hashtag and Storify make it easy to publish the finished stories, but we lose 11-12 characters. 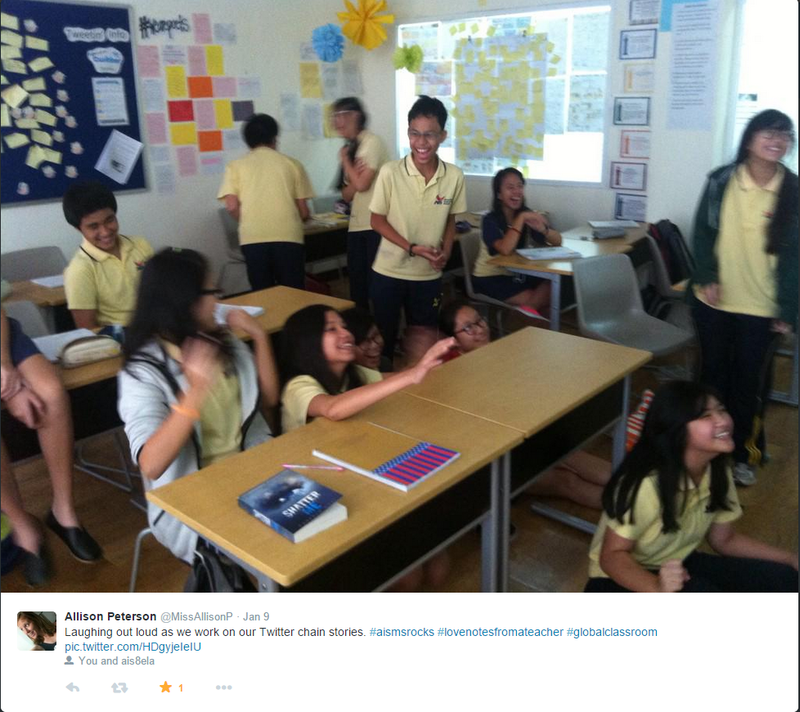 Once all of the students tweet, it’s easy to search for, and individually drag them into the story. 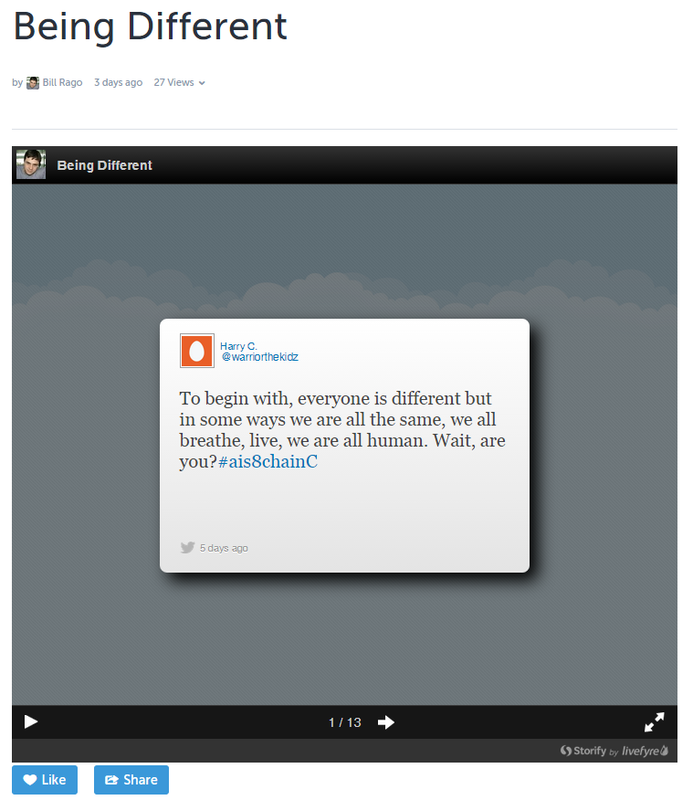 The above screenshot shows Storify’s main editing page. The menu on the right-hand side allows you to search for many different types of content. For our story, I clicked on the twitter icon, then typed in the the hashtag for the class I was working on. Here you can see that my search grabbed all tweets containing the hashtag I had specified. Since the hashtags for each class are unique, the search doesn’t grab anything unrelated. From here, you can drag the posts into the main story. I think it’s easier to drag them individually since they show up with the most recent first, which is actually the final tweet of the story. The next step is publishing the story. 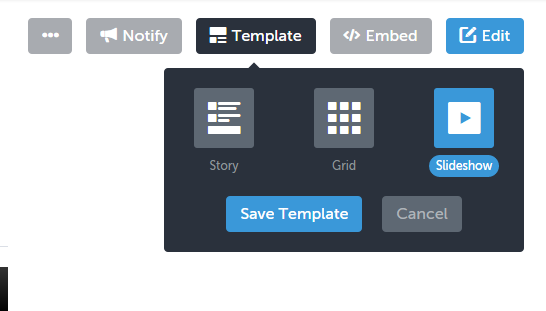 After clicking the publish button at the top of the page, you can change the way the story is displayed. Clicking the template button brings up this menu. Here you can choose the way your story will be displayed. We chose the slideshow because it worked best with the way we wanted to read the finished story in class. Our next step is to do another story with the entire 8th grade. From there, we may ask other classes to join, as Mr. Mayo did. Another thing I really like about this is that we can use the tweets to focus on language. Eventually, we’ll use them to create editing exercises that we can do as a whole class or in small groups. The English proficiency level of the students at my current school varies greatly. This presents a challenge when dealing with corrective feedback on writing assignments because we don’t know exactly what each of our students knows; we know what they were taught in 7th grade (I teach 8th grade), but with new students coming in all the time, it only helps so much. Corrective feedback on structural and/or grammatical topics the student has never learned gets them nothing except more confused, as it does with oral correction. We needed a way to help the student notice their errors, provide corrective feedback, and NOT overwhelm them with a page or red ink. The answer to our question was first presented in 1978 by Levenston. I wasn’t around then, but it was a great year – Darkness on the Edge of Town and Van Halen were released, so ‘reformulation’ is in good company. Reformulation is when a native speaker rewrites a student’s piece of writing. The native speaker writes to make the piece sound more natural, making organizational and grammatical corrections while preserving the content of the original text. For more information on the history of reformulation and present status of reformulation research, read “Reformulation, Noticing, and the Development of L2 Academic Writing” by Jackie Dannatt. We chose to use this technique with our struggling writers because it is naturally scaffolded and student-centered (Reid, 1994, Cited by Tardy, 2006). As you can see in the example below, we ask the student to do several things. First, they have to identify the change and write the original text and reformulated text in the table. Next, they have to describe the change. 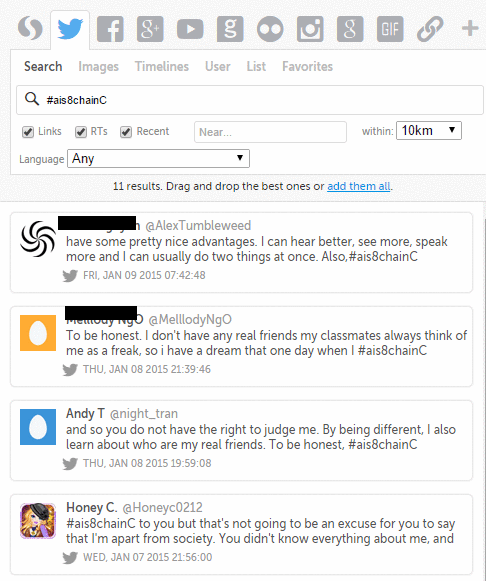 What I like about this is that it allows all students to comment on the change. The student could say something like ‘moved words’ or ‘fixed fragment’, depending on how much they understand. Finally, they have to check yes or no to let us know if they understand the change. This will help us plan follow-up support for the student, in groups or individually. 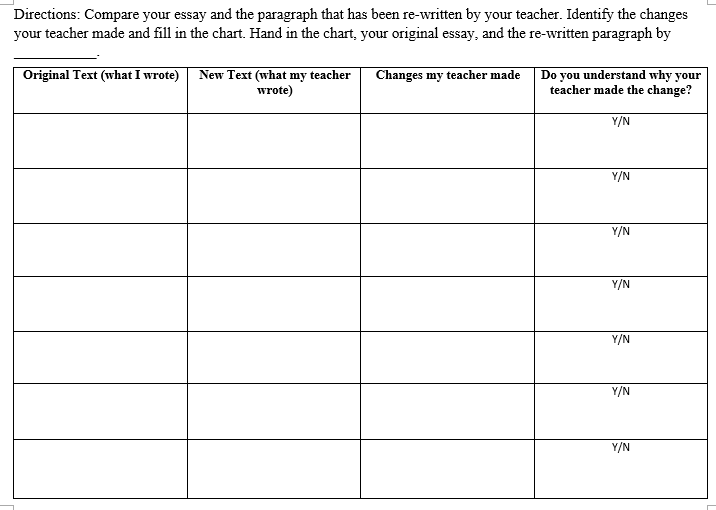 After getting the completed tables back from students and doing this on future writing assignments, we’ll be able to plan more appropriate practice as students pre-write and draft. I’ll be updating this post in the next few weeks with some samples of the completed tables so please check back. Levenston, E.A. (1978). 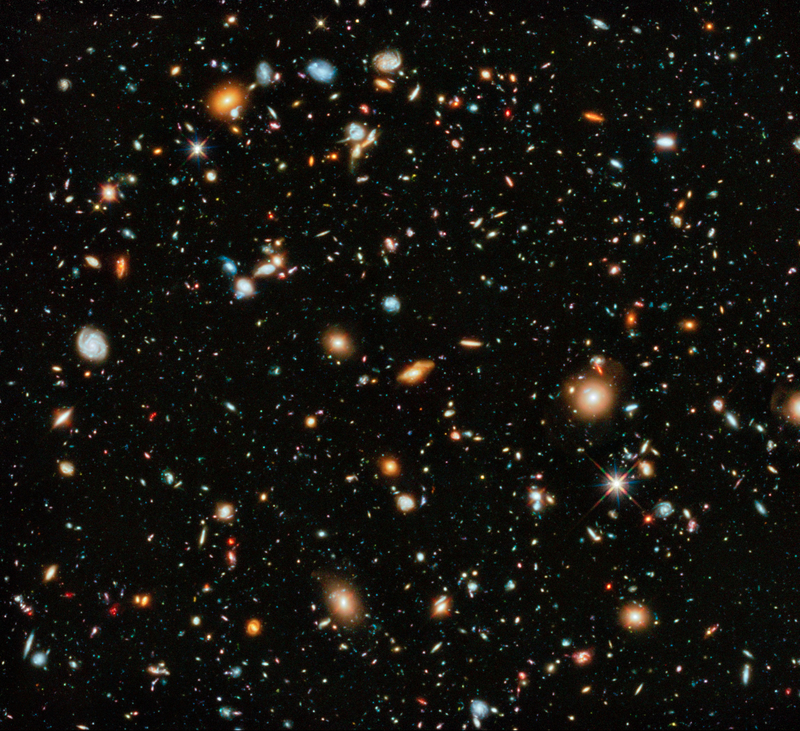 Error analysis of free composition: The theory and the practice. Indian Journal of Applied Linguistics, 4(1), 1–11. Tardy, C. (2006). Appropriation, ownership, and agency: Negotiating teacher feedback in academic settings. In K. Hyland & F. Hyland (Eds. ), Feedback in second language writing: Contexts and issues. New York: Cambridge University Press.